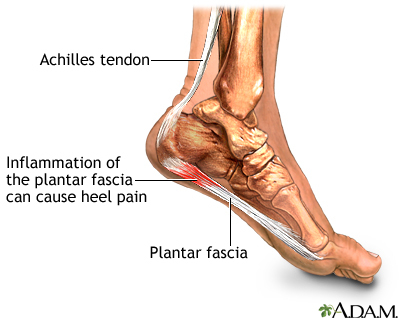 Plantar fasciitis is the most common cause of foot pain in athletes. But, unfortunately, it’s not exclusive to athletes. Normal people can get it, too. 1. Overtraining. This mostly applies to runners who keep pushing themselves through the pain. Great for your ego, terrible for your feet. 2. Overtraining with improper footwear. Your running shoes are only good for about 400 to 500 miles, depending on the shoes and how hard you train. 3. Just improper footwear in general. 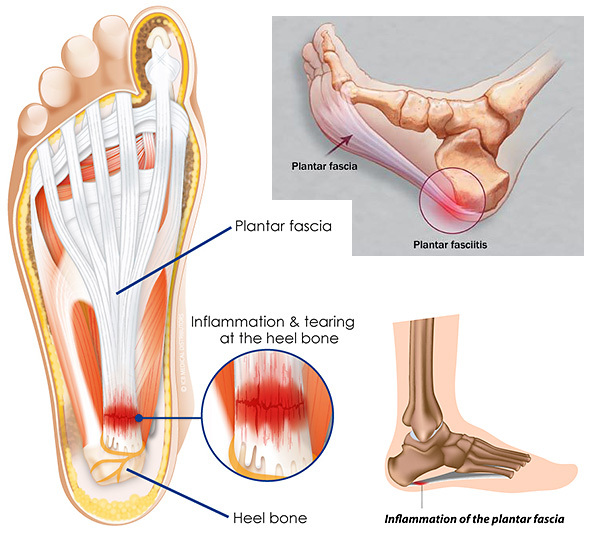 Shoes that lack arch support, or shoes that force your foot into constant plantar flexion (ie, high heels) contribute greatly to the onset of plantar fasciitis. 4. Age. Most people who suffer from this are between the ages of 40 and 60. However, this does not mean you’re immune if you’re in your twenties. It just means you’re going to feel that much older when you get it. 5. Weight gain and pregnancy. 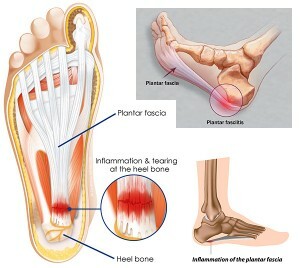 They both have the same effect, which is placing extra stress on the fascia in your feet. 6. Etc. God forbid you suffer from the dreaded etc. The primary symptom of plantar fasciitis is pain in the bottom of the foot, particularly the first few steps you take in the morning. The pain usually goes away throughout the day as the tissue warms up, and then comes back later in the day as the tissue fatigues, or after sitting for long periods of time. What most people don’t know is that the tendon from your calf muscles basically turns into the fascia on the bottom of your foot. That means tight calf muscles will put an enormous stress on the plantar fascia. So before trying anything else, try loosening your calf muscles with self massage, or with a heat pack, or get a massage. Remember, as with many disorders, the location of the pain does not always indicate the location of the problem. If you have flabby calves and the pain is still there, our answer is still: get a massage. A qualified massage therapist will strip through the thickened fascia of your sole and break apart the adhesions limiting your mobility. The stripping should be administered from heel towards the toes, as there is always the chance of a bone spur developing on the front of the heel. Which means if you strip through from toes towards the heel you might literally be stabbing your client with their own tissue. If no bone spur is suspected, frictioning at the attachment site on the anterior medial heel will help to loosen the fascia as well. Hydrotherapy for plantar fasciitis should be heat before the treatment if no inflammation is present, and ice after to control any inflammation you may have created. 1. Stay healthy. Less extra weight means less extra stress on your feet. 2. Wear better shoes. No high heels. No worn out sneakers. And don’t go barefoot on hard surfaces. 3. Stretching. Stretch your calves and your plantar fascia by forcing your foot and ankle into dorsiflexion (forcing your toes up towards your head, like putting your toes on the ledge of a step). 4. Ice massage to relieve pain and reduce inflammation. A plastic bag with a few ice cubes in it works. A frozen paper cup is good, too, for rolling over the sore spots until it goes numb. And just to end this with a slight sales pitch: All our Soma graduates have been trained in the treatment of plantar fasciitis. If you want to book an appointment with one of our therapists, just follow this link.